The design software company uses Dropbox Business to collaborate more securely and efficiently, allowing the team to scale globally. 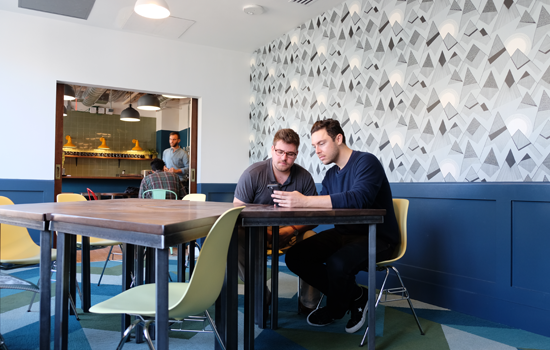 With Dropbox Business, employees collaborate more easily now that everyone has an enterprise account. As the product and design teams communicate primarily through Slack, the messaging app’s integration with Dropbox Business lets users pull Photoshop and Sketch files from Dropbox directly into chats. “Product is constantly sending messages to our developers and saying ‘Oh, the Photoshop document has been updated’, and they already know which file we’re talking about because it was referenced earlier as a Dropbox link” says Billy Kiely, VP of Product. Weberman says that other employees who work mostly in Microsoft Office rely on the Dropbox badge. The feature lets viewers share files and update to the latest version when someone else makes changes, all within Office. “I’ll work with different members of the Finance team and, instead of sending Excel spreadsheets back and forth, we can collaborate at the same time” he says. Dropbox Business has made it easier for InVision to centralise and keep track of key company data. Weberman says that management can easily add new employees in bunches and maintain tighter security over customer design files by enabling features such as two-factor authentication. “Requiring that additional passcode makes our devices much more secure, and that’s really important with our distributed workforce” says Weberman. Dropbox Business helps keep InVision’s employees more organised, Kiely says. Individual users like the fact that extended version and deletion recovery saves them from losing work. “Now that everything is in Dropbox, I feel safe that I’m not going to accidentally overwrite or delete something” Kiely says. “I can always go back and grab an earlier version.” Dropbox Business is helping the company’s product and design teams keep pace with the growing demand for InVision’s product. “I know I can wake up early in the UK and just go into those shared folders and grab the required dossiers, without having to wait for people from the US to come online later in the day” says Andrew Cullen, Lead Product Designer. Ultimately, Dropbox Business has allowed InVision’s workforce to achieve the same goal – moving more quickly – that the InVision product promises its own design customers. “Collaborating on the same document in Dropbox has just made things a lot easier, and it’s been a huge, huge time saving for us” says Weberman.